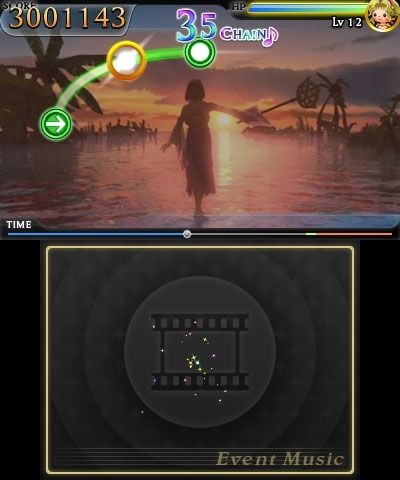 It's been over 25 years of Final Fantasy and so to celebrate we have our very own rhythm game dedicated to the long-running series: THEATRHYTHM FINAL FANTASY. The premise is simple you take 4 heroes from the Final Fantasy world and you guide them on a journey through the music of the series. The gameplay is as you'd expect from a touch-style rhythm game, you tap, slide, flick you way along with the music. The added bonus is that while you're doing all this you are either treated to a standard music video (cutscenes taken straight from the games - nostalgia factor 100) or your group of 4 intrepid heroes will battle an enemy of roam the wilderness. In the song library they use the terms BMS, FMS AND EMS. BMS (Battle music Stage) has you battling monsters during the rhythm game. FMS (Field Music Stage) sees your characters walking through some scenery and EMS (Event Music Stage) Features cutscenes or events from the series titles. The demo treats you to two songs: Man With The Machine Gun, a memorable favourite from the eighth installment and The Sunleth Waterscape from the more recent thirteenth title. The former has you in the setting of FF8, in Esthar battling monsters during which you can see the group summon either Ifrit or Shiva - both designs taken from the same title in the series, which is a nice touch. The Sunleth Waterscape sees you roaming the forest wilderness, riding a chocobo and then finding Snow Villers. 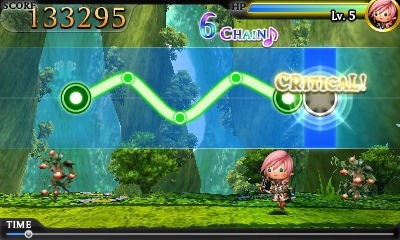 Definitely worth a go if you're a big Final Fantasy fan or a fan of rhythm games. Personally, I am both so I will be picking this up and enjoying the huge amounts of nostalgia that comes with it. The only negative I can think of is the DLC for this game will most likely be more of a hit for your wallet than it should be, which is a shame, but you don't need the extra DLC songs to have a good time with the game!